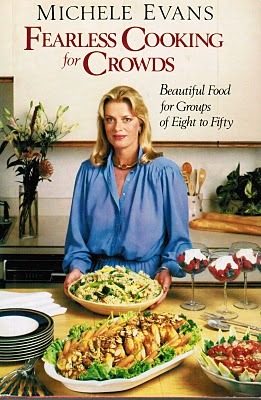 I have cooked countless meals for large crowds over the years, from baby showers, to graduation parties, to weddings, and this cookbook was one that helped me along the way. I love this book. Now you can have a chance to own it, too! Just send me an email, culinarycellar@aol.com with your name and email address and I will put everyone’s name into a hat and draw a random winner. Deadline is next Thursday, May 6th at 6:00 pm cst. I will have my hubby draw the winning name and will then post the winner on Friday, May 7th, and also send an email to the winner. I will be having cookbook give-aways again. No one can have enough cookbooks, right?? I thought this book would be perfect for my first give-away because May and June are filled with graduation parties, weddings, Memorial Day, and other activities where large crowds are expected, and you can have this book just in time to plan your event. 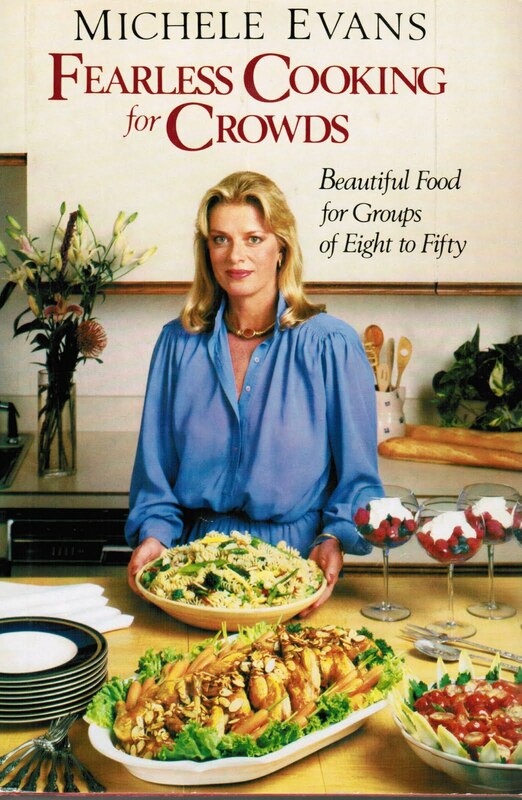 So let me tell you about this great book, Fearless Cooking for Crowds by Michele Evans. I first learned about it when a former neighbor went on a trip to the Virgin Islands and was invited to the author’s home for dinner. She came back and couldn’t wait to tell me about the cookbook and their dinner, which she said was fabulous. I have been enjoying the book ever since. The recipes are written to serve parties from eight to fifty guests. Michele takes the guesswork and fear out of a serving a large number of people, especially as many as fifty. Large parties can make even the most seasoned cook a little overwhelmed, but the key, says Michele, is organization. She has designed recipes for groups of 8, 12, 16, 24, 36, and 50, and many recipes can be doubled. There are accompanying charts on cooking large amounts of items like pasta and rice, and detailed instructions for assembling a recipe for a large crowd. Preparing a meal for fifty is not ten times more difficult than preparing a meal for five; it’s just that there’s more food to work with. In the first chapter called “Strategic Planning,” Michele talks about taking control of every detail like time, place, number of guests, invitations, themes, entertainment, serving styles, menu planning, what you can make in advance, food storage, and how to stock a bar. The last chapter is menu suggestions, which make it so easy to plan a large gathering. She has everything planned out from appetizers to desserts, so your entire party can be planned from just this one book! But how are the recipes, you ask? I can tell you firsthand that they are incredible. I used the book for both of my daughter’s college graduation parties. One of my favorite hors d’ oeuvres was the “Colossal Black Olives Stuffed with Pesto-Cream Filling.” There are recipes for both hot and cold appetizers. One of the pasta dishes I made was a huge hit. It was a peanut-sesame cold noodle salad to serve 24. I loved it because it could be made the day before. Another make-ahead hit was the “Cold Roast Fillet of Beef with Green Peppercorn and Mustard Sauce.” If your crowd includes vegetarians, there are endless recipes including vegetables, fruits, pasta, bean, and lentil dishes. Cooking for a crowd of people should be a celebration. There is something special about entertaining groups of friends and family in our own homes that is the ultimate expression of friendship and love for family. If you plan a party well and create a mood of warm hospitality and relaxed atmosphere, your crowd will need little looking after. They will just sit back, relax, and enjoy your fabulous food – especially if you use this great book! Some Really Great Desserts, Plus a Wedding Cake! WOW! Do I need this book. SOunds wonderful. With a wedding planned for October I will have my hands full with large group entertaining.